When contemplating building a model of the DEY-2 switcher I read the information and looked at all the photos and drawings that could be found about these unique locomotives.The most important thing taken away from this research was the simplicity of the design and construction methods that General Electric used to build these ten locomotives. The utilitarian design of the superstructure would afford ease of construction. Almost all the surfaces are flat and meet at square corners, the only exceptions being the curved cab roof panel and the compound curves of the long and short hood tops. Further simplifying construction are the flat hood ends that eliminate any need to fabricate curved corners where these ends meet hood sides or hood top, nor fabricate bullnose corners where the ends collectively meet the hood sides and top. The prototype switchers were completely fabricated by cutting to size and welding together various thicknesses of flat plate and sheet steel. Again the only exception would have been to roll a curvature into the roof panel and hood top. The chassis/underframe is of similar utilitarian design and welded construction , the 1 1/2" thick slab top, pilot ends and buffers were all fabricated from flat steel plate. The boxy design of the prototype looked no more difficult to build than a static structure model, actually some station models that I have built were more complex. The same construction method of the prototype could be employed using various thicknesses of flat sheets, but this time with styrene plastic and gluing them together instead. 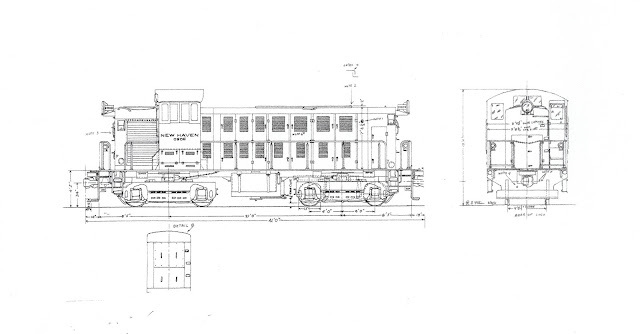 This switcher was to be built as a functional model, therefore needed a powered chassis. Not particularly wanting to start out by scratch building a brass plate power chassis, I was looking for a less time consuming and easy way out of this step of the project. 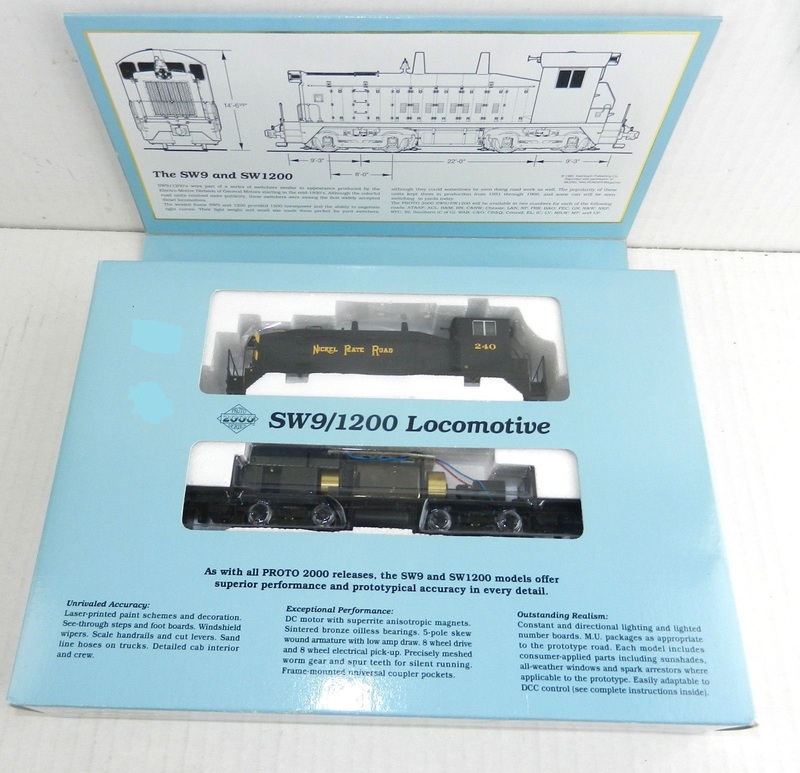 I luckily stumbled on a model that I already had but never did anything with, a Proto 2000 SW 9/1200 switcher. 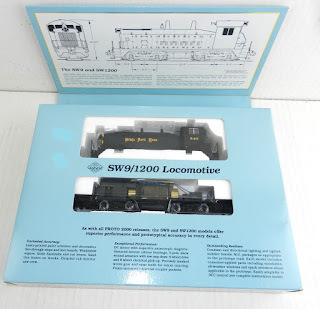 On the box of Proto 2000 locomotives there is a side view drawing with dimensions of the enclosed model, the drawing of the SW 9/1200 revels that the trucks have a wheelbase of 8' and the truck centers are 22' apart. The DEY-2 has the same truck wheelbase of 8', but the truck centers are one foot shorter at 21'. One foot? Excepting this dimensional discrepancy meant resigning to the fact that at one foot to long this model was only going to be a reasonable similarity of a DEY-2. The Benefits though out weighed the negative, using this proven RTR power chassis would save much time in construction and help with operational reliability in the end product. One foot be damned, the decision was made to use this power chassis. Back in February I posted about an Alco DL-109 locomotive shell that was re-sided with styrene to change the configuration/appearance of the as manufactured body shell. The DL-109 is below with an additional re-siding project, an Osgood Bradley combine that was made by re-siding a Branchline coach kit. This re-siding method has worked out well in the past so I decided to again go this route with the DEY-2 if a donor shell could be found with the correct hood curvature. On the original GE drawing below there is no dimensional data for any of the superstructure. Resizing this drawing to HO scale was the only practicable way to get these dimensions and the proper curvature of the cab roof and hood top for modeling. This drawing was therefore used exclusively for the dimensional data to build the model. Using the above drawing an Atlas RS-1 body shell was matched against the hood curvature shown in the end views, the shell was found to have the correct curvature for the top of the long and short hoods. The Atlas hoods are a little short in height but that can be easily corrected, and a few thousandths to wide but that will be overlooked because the inside hood width has to clear the width of the motor that powers the chassis. The radius of the Atlas cab roof is too tight, that will be corrected with a new roof. So with an established base of a Proto 2000 SW 9/1200 donor power chassis and the Atlas RS-1 donor body shell, this scratch-bash, re-sided reasonable-similarity of a DEY-2 begins. Starting with the Atlas RS-1 shell, the molded on detail was removed from the hoods with a file until the sides and top were smooth. The RS-1 cab roof overhang is removed and the sides of the cab are also filed smooth. The cab is also to long so the appropriate amount of material is removed from the center section. Although not necessary, two separate cabs fronts were used to make it easier because the rear of the cab has steps on both sides that would have to be removed, I had an extra cab on hand because a used shell was purchased at a show to experiment on. The chassis is striped of motor and running gear in this photo. Some material needed to be removed from the chassis to make clearance for the new body shell to sit flat on top of the chassis, I don't remember this being difficult because this was accomplished quickly with just a hacksaw and finished up with a flat file. In the excitement of starting a new project I forgot to take a "before" photo of the chassis for comparison. Maybe this photo from the net will help? Here the shortened Atlas hoods and cab sit on the Proto 2000 chassis, this is the base chassis/structure that will become a DEY-2. Kind of starting to resemble the basic shape already. Next time will re-side the long hood. Thanks for sharing this quality information with us. I really enjoyed reading. wrinkle free duvet cover queen Will surely going to share this URL with my friends.